Many patients experience some pain relief benefits from ESI [1,2]. For those who experience only mild pain relief, one to two more injections may be performed, usually in 1-4 week intervals, to achieve full effect. Duration of pain relief varies, lasting for weeks or years. Injections are done in conjunction with a physical therapy and/or home exercise program to strengthen the back muscles and prevent future pain episodes. With few risks, ESI is considered an appropriate nonsurgical treatment for some patients. 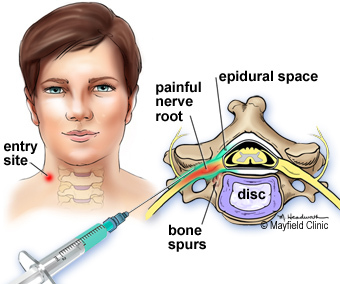 The potential risks associated with inserting the needle include spinal headache from a dural puncture, bleeding, infection, allergic reaction, and nerve damage / paralysis (rare). Corticosteroid side effects may cause weight gain, water retention, flushing (hot flashes), mood swings or insomnia, and elevated blood sugar levels in people with diabetes. Any numbness or mild muscle weakness usually resolves within 8 hours in the affected arm or leg (similar to the facial numbness experienced after dental work). Patients who are being treated for chronic conditions (e.g., heart disease, diabetes, rheumatoid arthritis) or those who cannot temporarily discontinue anti-clotting medications should consult their personal physician for a risk assessment. Weinstein SM, Herring SA: NASS. 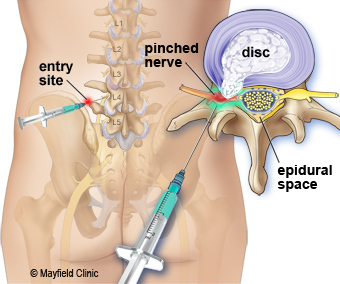 Lumbar epidural steroid injections. Spine J 3(3 Suppl):37S-44S, 2003. Lutz GE, VAd VB, Wisneski RJ: Fluoroscopic transforaminal lumbar epidural steroids: an outcome study. Arch Phys Med Rehabil 79:1362-1366, 1998.
chronic: a condition of slow progression that continues over a long period of time, opposite of acute. corticosteroid: a hormone produced by the adrenal gland or synthetically made. Regulates salt and water balance and reduces inflammation. 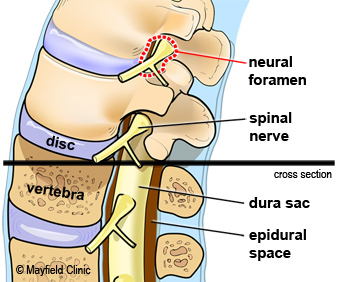 epidural space: the area between the membrane surrounding the spinal cord and the vertebral wall that is filled with fat and small blood vessels. We perform more than 3,100 spinal injections each year. Mayfield has two dedicated pain relief suites, one at our Crestview Hills, Kentucky, office and the other at the Mayfield Spine Surgery Center in Norwood, Ohio. We also perform these services at most outpatient centers in the Greater Cincinnati. Dr. Marc Orlando guides a patient step-by-step through an epidural steroid injection (ESI) in the neck, or cervical region of the spine. Dr. Marc Orlando describes step-by-step what to expect during a lumbar epidural steroid injection (ESI) in the low back.